We began the day with a big, early breakfast of eggs, fruit, toast, and cereal at the hotel and then left to catch a morning flight from San Cristobal to Isabela, the largest but youngest island of The Galapagos Islands. There were only ten seats on the plane, including the pilot! Puerto Villamil is the port town that we will make home for the next three days. 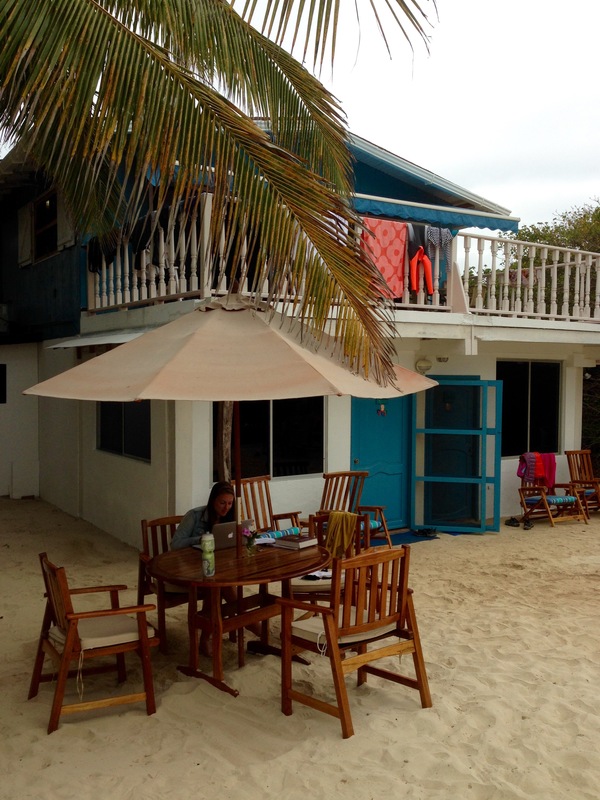 We were pleased to find that our aptly named hotel, Isabela Beach House, is right on the beach! Also, coincidentally, our room is called “Luna de Miel”. We settled in for some R&R followed by more R&R and homework. The hotels so far have felt more like B&Bs, and this one is our favorite yet. We have a room with a balcony; certainly can’t beat the location! Before climbing to the Wall of Tears, we took a quick detour to see some pink flamingos in a brackish pond. Next, we toured through a hatching center for the Giant Tortoises. They are impressive behemoths! This little one isn’t an impressive behemoth… yet! After the tortoises, we left town and rode parallel with the beach for a while, sometimes spinning our way through deep sandy sections. We had it easy in comparison to Scarlet, though, because she had to pull more than her own weight, toting Millie around on the back of her bike. We also passed by a graveyard in this section, with ornate and very colorful above-ground tombs. They had recently been repainted for Dia de Los Muertos; it was a much more cheerful scene than the graveyards we are accustomed to. Chris rode ahead with Connor while I hung back with the others, and, just before making it out of the last section of deep sand, my chain snapped. Maritza immediately called the bike shop, which wasn’t far away, and they brought over another bike. Jon rode ahead and reported to Chris, “Your wife broke her chain.” At first, he thought Jon must have been talking to someone else, since “wife” is still new for him. He realized quickly, though, and laughed. It brought back memories of our bike trip to Scotland when the same thing happened to his brother, Corey. Fortunately the replacement bike was delivered quickly, and we were off. At this point the road surface transitioned to crushed lava stone, so the pedaling got much easier despite a gradual incline. On our way up to the wall, we saw one Giant Tortoise meandering about. The wall itself is very impressive, and the story behind its creation is interesting; it was built by prisoners and serves no real purpose. We cruised into town just as it got dark out. We stopped at a restaurant to split a pizza before going back to the room (shameful food choice, I know). We got a “familia” size, because we were so hungry and did quite a good job on it (more shameful, yes). The leftover slices were taken back to our room (although we did not have a refrigerator) and were consumed the next day between activities.